Thanks for posting this, Barbara . . . This is the NEW WORLD ORDER's agenda for all of us! Remember, power in numbers, divided we fall, let's all stay united, worldwide. There are more of us than there are Bilderburgs or Bilderbugs. Thanks for posting this; and thanks, Just C., for fwding it to me. As I pointed out in the comment I posted on the actual article after visiting the site: this 'protocol' is part of the unbroken history of police-state tactics in the UK - reminiscent of the mass-internment "policies" in the North of Ireland; and, it explains yet again why there is such a "special relationship" between the UK and the USA - both 'nations' having an unbroken history of trampling on civil rights, and of imperialism at home and throughout the world. OUR TIME WILL COME - MITAKUYE OYASIN - WE ARE ALL RELATED - FIGHT FOR LOVE AND JUSTICE! Oh Carole, I had to laugh when I saw the title of your forward to me I said to myself "WTF!!!" and then when I opened your message that was your opening comment too!!!! Great minds...what can I say. Free speech, it ain't really free at all. This is one reason why I will never watch or support the Olympics in any way ever again It has become an excuse for governments to prove to us once again how evil they can be. Thanks Barbara for posting this story and thank you Carole for sending it to me, luv ya girl. Did anyone note the date when this act was passed? Did the British people object then? How come it was passed? How come it slipped through? Whatever do the Bu$h people have to do with Acts being passed in the U.K.? I fear that the British have become incredibly apathetic..reduced to moaning and voting.We have in the past 40 years gone backwards,as our civil liberties,union rights and once public services have been eroded in the privatisation lovin,community squashing ,free market. We had so much in the post war period..but have gone down a US style road..with our two major parties at elections ,offering a grim contest of right wing vs centre right. We still have more fairness than the US..but always the corporate scum,are looking to erode what working class people with guts and brains fought for. It is a fight,it is an international fight and it is one that we will all lose,unless the zombiefied quasi-derelict consumers wake up. We had around 2 million people march against Cheney's War in Iraq..so the potential is still there in Britain. As for this tale re the olympics..it is again a case of the police being used to make the world safe for expropriation.The police do some good work in Britain..some solid community work..but increasingly they are becoming more paramilitarist..
OMG! They must have sneaked this in quietly...usually thru distraction. So much for democratic rights. Sounds like this one must have been slid under a pile of stuff and gone unnoticed. I can't imagine a democratic nation not standing up against this before it received Royal Ascent. Thanks for forwarding this to me Just C and for posting it Barbara. Looks like a case of politics gone wild.What a bunch of sneaky no-gooders. Thanks to Barbara and Carole, this really is UNFU*&ING believable. How did it get through? Because the British press seems to be as lousy as the American press, isn't that supposed to the function of the press---to inform? I had to laugh that Scotland Yard has no plans to use this measure, they don't need plans to use it as they now have it, guess democracy in the UK is as much a dusty memory as it is here in America. And just what if some citizens don't care for the influx of people, traffic and pricing for the Olympics, why is that so threatening to the government? These sneaky items that get added to bills in our Congress are the prime reason that I believe need reform on bills, one bill one item no amendments. That, of course is a dream that is not about to happen. Remember the credit card bill? It was useless and did nothing, but no one noticed because all that was talked about was the gun amendment added at the last minute. I do hope the people of the UK will fight this, it's worth fighting. Thanks Barb for this story. Unbelievable! Thanks everyone for the comments, support, and information (yea, Eureka M.!). We need to be aware of these inroads on our security; I can see them coming to the U.S. in the near future. Bleah. This is how they do things, sneak a little clause in a budget or some other thing. Next thing you know it is ingrained in the system and then everyone goes WTF. They are sneaky and I think the whole lot. It saddens me that this is happening in Britian and our Country as well. So many Countries have looked to our systems for their possible freedoms...when we go down it doesn't help them either. We loose more than our own personal rights and freedoms...we were a beakon for many. The only thing(s) that are being torn down is the greed, selfishness, fear and abuse of power of the old paradigm. The time of truth, unity and sharing is here, hang on for a minute, lol. :) thx barbara! I love these comments -- and the growing awareness . . . I saw this last night and read noted it but did not have a min.to comment. Thanx C 4 fwding,Thanx Barbara for a very important read. You cannot currently send a star to Barbara because you have done so within the last week. This is what you get when you vote for capitalist parties, such as New Labour, and the Conservative Party. Why is this so hard to believe? It has been happening here in the US all the time for ages now. Congress does not read the bills nor even attempt reading the 942 page ones. They rely on Lobbyists and pay offs. Lots of stuff gets sneaked into the bills that we have no clue about and to our demise. Join a grass roots petition site growing steadily in numbers fighting for your rights. We can do something about it! www.downsizedc.org Read the Bills Act and One Item at a Time Bill plus many more great petitions. You don't suppose it's a coincidence that Hitler started the resurgence of the Olympic Games, do you? I think it's fair to say that Nazis are shape-shifters. I thought that we had the democratic right to protest or give our point of view. I don't agree with the group that are against the Olympics but I think the powers now given to the police are Draconian and the short end of the stick. Oh dear Lord what�s becoming of the world, governments are becoming more totalitarian. Seems people are afraid of their own shadow and what happen to freedom of speech! Oh dear oh dear oh dear......I do believe this country is in meltdown - how sad!!!! Whatever NEXT will the "powers" that be concoct in order to control the lives of the British population???? I'm almost at a loss for words, and that, for me, is most unusual!!! The right to peaceful protest is supposed to be a given in a TRUE democracy - obviously something we don't have here anymore. It's definitely time to re-think the choice of government......do they not think the police should rather concentrate on more serious matters, like security and catching the criminals who are all going to come out of the woodwork when the Olympics are on?? Maybe not though.....bit too much like hard work I suppose!! Let's take the easy road, and forgive us if we bend over backwards to appease the rest of the world! 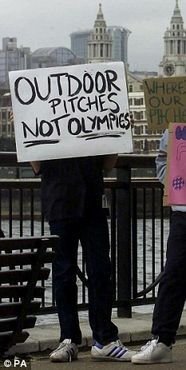 This beggars belief, and I for one will NOT be supporting the London Olympics in any manner or form! I will also NOT be voting for the current administration in the next General Election!